Feel summer through Japanese traditional way "Nagashisomen"
Nagashisomen (Flowing noodles) experience which is one of the trademarks for summer in Japan. Friends, couple, family. Everybody's welcome! You are able to make lane, bowl, and chopsticks with bamboo by yourself. Why don't you feel summer through Nagashisomen (Flowing noodles) experience which is one of the trademarks for summer in Japan? 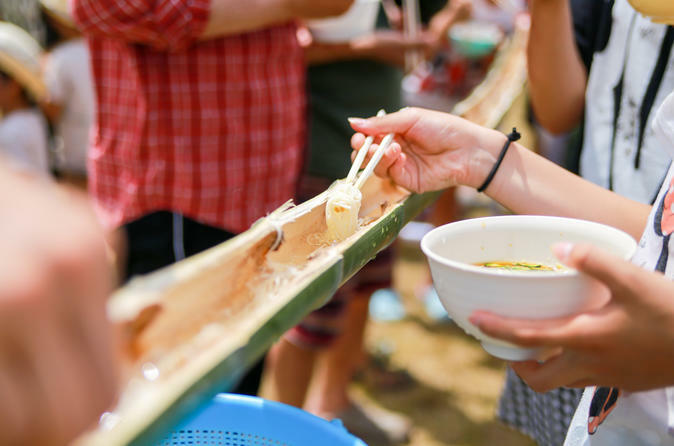 Nagashisomen is the act of eating somen noodles with a chopstick off a running water slide. It is said that this is a way of eating thought to obtain coolness in the summer heat. Somen noodles run over on the bamboo. Are you able to catch the noodles and eat it?! In this experience, it starts with making lane, bowl, and chopsticks with bamboo. Also, you are able to experience Suikawari. (Watermelon splitting) Why don't you experience unique experiences you have never done before in this summer?